Wow. Talk about a loaded question from my ten year old son. We were driving in the car last week and he asked the question after hearing the news on the radio. I was glad to discuss it with him and even happier that we had about 45 minutes more to our destination. I was tried to formulate in my mind how to present the facts to him about the events in Ferguson in a way that he would understand. I started to talk about racism in America and he asked a second question. “What’s racism?” Huh? How could he not know about racism? I realized that my son’s innocent image our country and people in general was going to be changed when he learned about racism in America, in 2014. I tried to put it in terms that he could understand without sounding preachy. Our conversations went something like this. Me: How would you like it if I told you that you couldn’t be friends with your friend X any longer? Son: Why not? He’s one of my best friends. I just went to his birthday party yesterday. Me: Too bad. I don’t like him. He’s not a good influence on you. You can’t be friends with him. Son: What? That’s not fair. I like X. He’s funny. He’s smart. He’s my friend. Me: Son, I like X. I like his parents. I’m glad he’s your friend. I said that to show you about racism. But there are people in our country who would not let their kids be friends with X because of the color of his skin. Because it’s different than theirs. That’s an example of racism. Son: But that’s not right. Why would that matter? Me: You’re correct. It’s not right and it shouldn’t matter. But people still act like that. Son: Really? That’s not nice. It’s really not fair. I wish that I could have given my son a response that would satisfy him and his desire for fairness. It made me sad, really, that my generation hadn’t done a better job of making real changes to eradicate racism. Unfortunately, racism is still alive and well in our country. If the events happening almost daily don’t convince you then take a look at the comments on almost any article related to these events. The hate-filled language is disgusting. Embarrassing. Sadly, I’ve seen it from people on both sides of the issues. People should be ashamed of themselves for thinking, much less actually writing, such awful words. I tried to explain to my son that one way to try to stop the racism and intolerance was to be kind. Always. Be. Kind. I know that it sounds simplistic, but could you imagine what would happen if everyone, I said everyone, was actually kind to everyone else all of the time? The “Golden Rule” isn’t too radical, is it? Treat others how you’d like to be treated. Kind of revolutionary, right? I was able to tell my son that part of the reason I discipline him and his sisters is because I’m trying to prepare them for a lifetime of treating others with love and kindness because it’s the right thing to do. Being loving and kind never goes out of style. The second thing I told my son he could do to help stop racism in America is to be bold, like a lighthouse on a cliff. To speak up when he sees and hears racism and to not tolerate it among others. Ever. Not even a little bit. I shared with him an example of when a close friend made a derogatory remark about someone working in a drive-thru and I called him on it. Right there in the car. He tried to justify it because a person of that same skin color had attacked his family one time when he was a kid. He claimed he was scarred for life. I called B.S. on him and challenged him to change that attitude for the sake of his kids. I wish I could say that my words caused an epiphany in my friend and that he did a 180 from that moment on. Even so, he knew that what he did was wrong and he knew that I wasn’t going to put up with it. Social media and the web in general have combined to give all of us a voice that can be used to build up and tear down. I’m disgusted by how many people make awful comments about what’s going on in the world. Spend five minutes online and the comments about pretty much any news article turn downright nasty pretty quickly. And it’s not just one side or the other of the political spectrum. It’s rampant among liberals and conservatives calling each other names and spewing hate. It’s got to stop. And it’s up to each one of us to decide that we’ve had enough and make sure that we each speak up boldly for the truth. 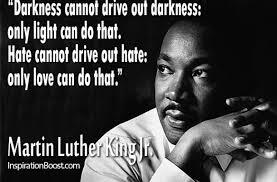 Are you willing to be the light that not only exposes the hate of others but leads them to a better place? Thirdly, I had to tell my son that sometimes the police treat people differently because of the color of their skin. He was incredulous. I told him about the experiences of some black men that I know who recently shared experiences of being stopped and questioned by police simply because of their skin color. These guys are college-educated, middle/upper class, married and employed. Yet that didn’t stop the profiling. I’m trying to build empathy in my children so that they can begin to understand that everyone has a unique story to tell based on their own experiences. I’m obviously not black so I cannot ever fully understand what it’s like to grow up black in America. I can, however, listen to the stories of others and come along side them to stand up for what is right. I had to explain that we, as white men in the United States, enjoy a freedom or privilege that black people, and black men in particular, do not share with us. While we have a responsibility to obey the government and the authorities in a respectful manner, we also have a responsibility and a right to disagree with it when necessary. I grew up in a very white area of northeast Wisconsin and only knew one black person my whole childhood. I didn’t even know about the concept of white privilege until I learned about it in a School of Education class as a senior in college in 1994. I was 22. At that time I bristled at the notion that I enjoyed privilege simply because I was a WASP (White, Anglo-Saxon, Protestant) male. I didn’t think I was racist or that I should have to apologize for my race because some people of my race were racist, either currently or in the past. I always thought that if you worked hard and obeyed the government and the police that you would succeed in the U.S. Over the last 20 years I’ve come to a better understanding that there is, actually, inherent privilege in being white. It’s sad that this is true. We still have a lot of work to do. We cannot ignore this any longer and pretend that it’s a only problem within the black community. We need to work together. Not just black people. Not just white people. All of us. Together. After all, we’re all part of the same race. The human race. Below are several articles that I’ve found interesting, informative and enlightening over the last couple of weeks. I don’t necessarily agree 100% with each author but feel that it’s important to consider other perspectives than only my own. Be warned, though, that some of them are difficult to read because of the content and/or language used.